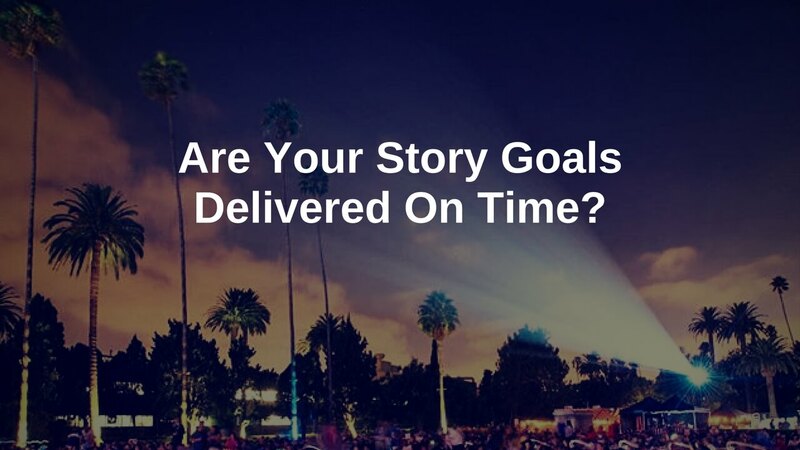 Are Your Story Goals Delivered On Time? First a quick recap: We’re talking about the specific, external goal that is the focus of the story. The pursuit of this goal is what moves the plot. It forms the structural spine. If you have a few scripts under your belt, you might already realize having a clear story goal helps you, the writer, through the development and writing process. Identifying the story goal early in the process makes the job of plotting your story and writing it through to completion easier, because you have an engine to rely on – the pursuit of that goal. A story built around a clear goal is also immeasurably helpful to the reader. When should the story goal appear? So if the whole story is built around pursuing this goal, then it’s probably best to introduce it as early as possible – right? Let’s think for a second about the life cycle of a goal as it might work in the real world. Say you want to run a marathon. You make it your goal to run the L.A. Marathon next year, in March. Maybe you even announce it on Facebook for some public accountability. It’s going to take months of training and discipline leading up to race day. That’s what the pursuit of that goal is going to look like. But what happened before you decided to embark on that big, ambitious pursuit? Something happened to create that goal in your life. A trigger created by a combination of your past, some event in your present, and your big picture desires for your future. This is the context for your goal. Just as in your life, so it is in your story. Before the pursuit of the goal begins, there are some important things that happen in Act 1 that create the context for the goal. We need to know WHO is pursuing it. We also need to know WHY they’re pursuing it, and why it matters. Without these, we’re not going to care whether the goal is achieved, or even pursued. So Act 1 gives us the context we need to understand who wants what, why they want it, and that it’s going to be a really difficult (but exciting, and worth it) goal to pursue. With the masterful and elegant setup you’ve just provided, we feel confident and safe going along on this ride with you. We’re ready to watch the main character embark on his plan to pursue the goal in earnest (aka Act 2). So the character doesn’t want anything before the end of Act 1? Great question. And it relates to something pretty common in spec scripts. If you’ve ever given or received the “slow start” note, you know where this is headed. It’s true, the story goal is usually firmly established by the end of Act 1. It’s easy to forget, then, that the story still needs some kind of direction and momentum in the meantime, leading up to the formation of that goal. This part of the script (Act 1) is sometimes referred to as the “Ordinary World.” It’s where we get to know and understand the main character and what’s meaningful to him. It establishes context for the story goal, as we discussed earlier. If we look at scripts and movies that don’t have the “slow start” problem, we can see that often the character wants SOMETHING on Page 1. It’s not yet the story goal that they’re going to pursue over Act 2 & 3, but there is something for them to pursue. So narrative drive – momentum – is created. Take Die Hard. John McClane shows up on Page 1 wanting to reconcile with his wife. Well, specifically he wants to get his wife to come home. The Catalyst creates a problem (terrorists). He learns of the problem and learns just how big of a problem it is (they’ll kill people – we see the CEO shot), and by the end of Act 1 McClane’s story goal is created – to free the hostages from the terrorists. Great. So you know your character should want something. But can we narrow it down? If we look even more closely at the Die Hard example, we might notice that the thing the character wants on page 1 is related to the overall story stakes. And this makes a lot of sense, since what the character cares about losing (aka, the stakes) tells us a lot about him, what he values, etc. It helps us get to know him and begin to empathize with him. Which is, if you think about it, the context we need to understand the story goal. In other words, starting off the story with the main character pursuing a goal related to his story stakes solves a few different problems for you. It shows us what’s important to the character, which helps us get to know him and empathize with him. It also provides narrative drive to grab our attention right away and carry us through the “Ordinary World” section. So the question of what does your character want has several answers, all of which are useful in building your story and giving it a constant sense of momentum. Brainstorming the variations on this question can help you come up with ideas to inform both plot and character arc. What does the character care about and care about losing? What does he want — related to what he cares about — on Page 1? What does he want once what he cares about is threatened? What does he want to accomplish in this story?